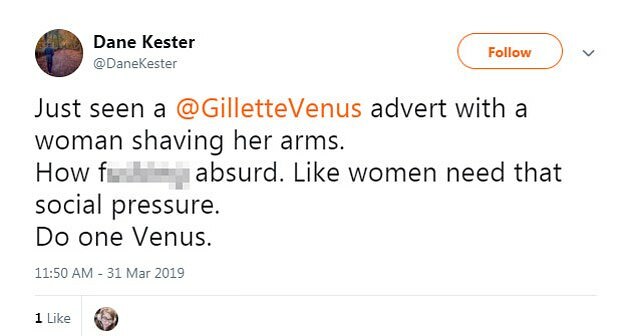 A Gillette Venus advert has sparked outrage online after it shows a woman shaving her arms with a razor. 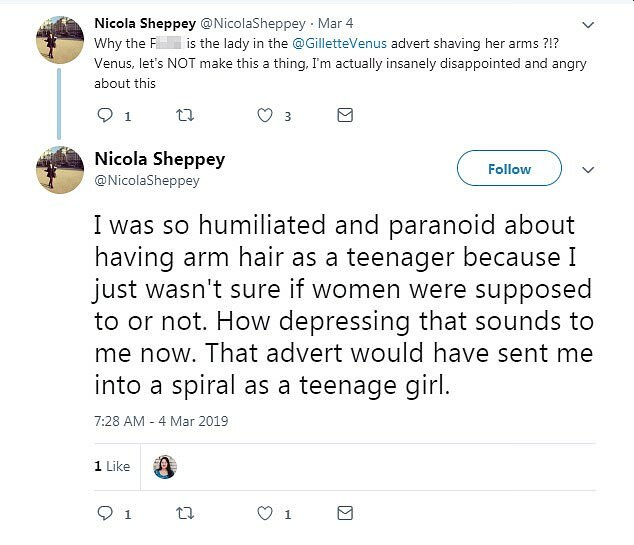 Social media was deluged with comments from viewers branding the new ad as 'absurd', with many claiming it would make teenage girls 'paranoid' about hair on their arms. The advertisement shows a woman with tattoos walking under palm trees before running a razor over her forearm lathered in shaving foam as she sits in a bath tub. It depicts females of all ethnicities, and also those with tattoos and vitilago, shaving before laughing together as they head to the beach. With the slogan 'My Skin. My Way', the shaving company promises a custom razor 'designed for wherever you shave'. 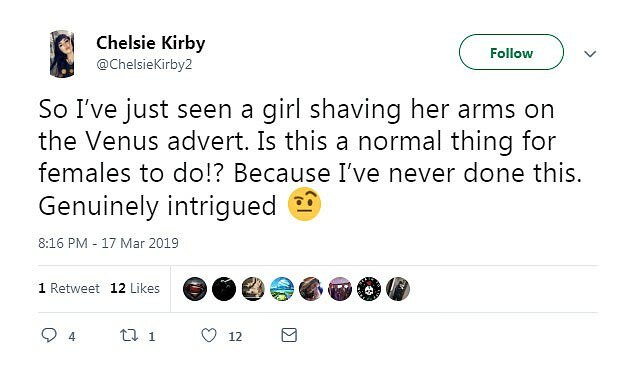 But many viewers took to Twitter to express their anger and confusion over the company's advert, with some questioning why shaving arms is now considered 'normal'. 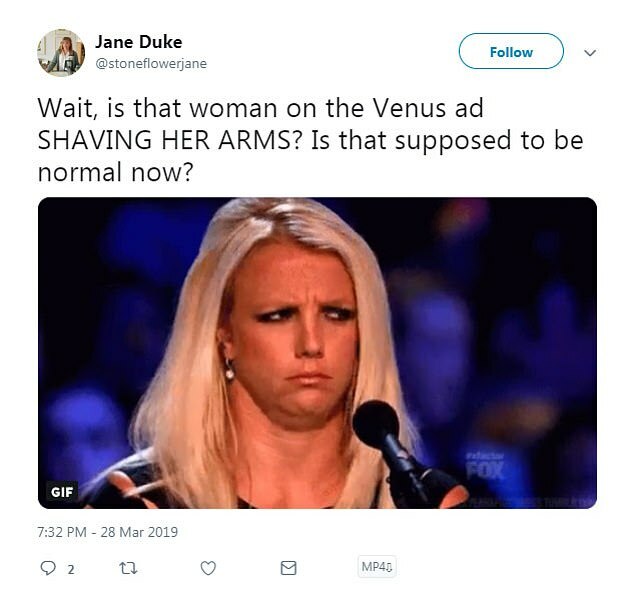 Others were 'disappointed' with it, claiming the advert, which is airing in the UK and the US, would make teenagers 'humiliated and paranoid' about having arm hair and that it added 'social pressure' to women. It isn't the first time Gillette has come under fire from viewers over razor promotions. 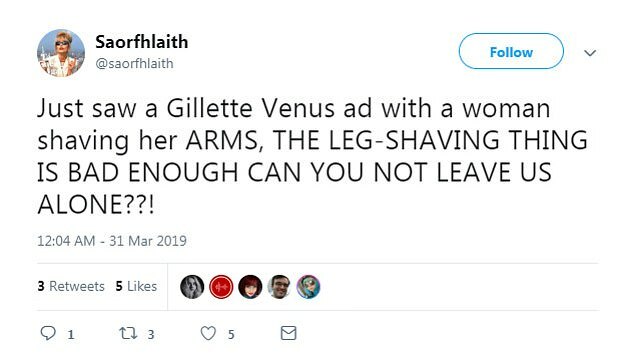 Hundreds of British men recently threatened to boycott Gillette over a new advert which references bullying, the #MeToo movement and 'toxic masculinity'. It shows a man talking over a woman in a boardroom, boys fighting and grown men ignoring them saying 'boys will be boys'. Britons were so angry about a controversial Gillette advert that they complained to the UK advertising watchdog – despite it not being shown in the country. The new ad, which critics claim is an assault on masculinity and portrays men as inherently bad, has sparked 15 complaints to the Advertising Standards Authority. 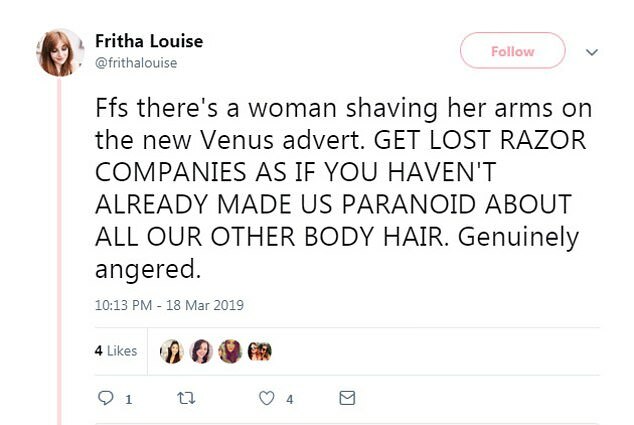 And women who use Gillette products blasted the shaving company for sexism for marketing pink razors called Venus to female users - just hours after its campaign to tackle 'toxic masculinity' divided the nation. I don't shave ANYTHING! Neener-neener. I shave UNDER my arms....not my FN arms!!!! Get a clue Gillette while you still have a company left!! !